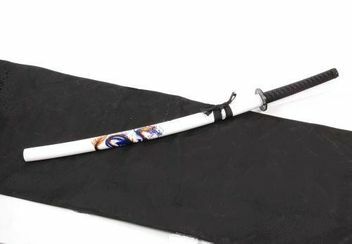 The blade of the Katana Kami White has been made of stainless steel. The handle is covered with an imitated ray skin. A black cotton cord wrap has been tied over the imitated ray skin. The Tsuba has been made of metal. The wooden scabbard has a black lacquered finish and a dragon motive. Delivery includes Katana and Saya.